I lost one whole night to ASOSFF… I just kept clicking…Annnnd, there IT was…Access All ASOS!! First clue… I'm now known as an 'INSIDER' (Hell yeah!!) 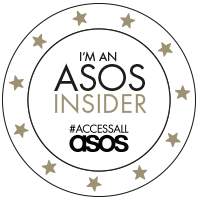 Basically, ASOS have opened their doors to their biggest fans (for which I'm never gonna' argue with) and there'll be exclusives, insider news, events which, also includes a trip to Planet ASOS (HQ), masterclasses, the chance to get involved with campaigns and tonnes of other exciting stuff!! How did I get Involved..? I clicked on this link and filled in the application form, that's it!! ASOS are looking for people who truly love a whole load of ASOS in their lives. You don't have to be a blogger, just passionate about ASOS, a teeny bit style obsessed and be happy to share your ASOS buys with your social media chums..It's not a toughie!! ASOS are looking for new insiders every month so go on, fill it in and join the party!! I got the 'welcome email' last week and literally squealed (then read it several times to check it wasn't a rejection!!) Then today, the 'welcome parcel' only went and arrived!! BIG LOVE for the personalised note!! New super fluffy yellow mittens which, are gonna' be invaluable when I get to Lapland in a couple of weeks!! (Oh, I've not mentioned this yet…?!) Buy here. Earrings - Neat, yet edgy…PERFECT! Fortune cookie - Come on destiny, let's see you!! I am honestly completely made up to be an 'Insider' and I can't wait to share all the exciting stuff coming our way!